Welcome to a mythical Man Monday! Quinoa? What? Quinoa isn’t real. It’s like the Tooth Fairy, leprechauns, or rational hippies — a wonderful thought at best, but inevitably unreal. Right? Rinse your quinoa in warm water for about two minutes. Heat a large frying pan on high and add quinoa. Let cook for 1 minute to let water evaporate. Add the chicken broth and bring to a boil. Once it starts boiling, turn heat to low and let cook, covered, for 15 minutes. Remove from burner and let stand, still covered, for 5 minutes. 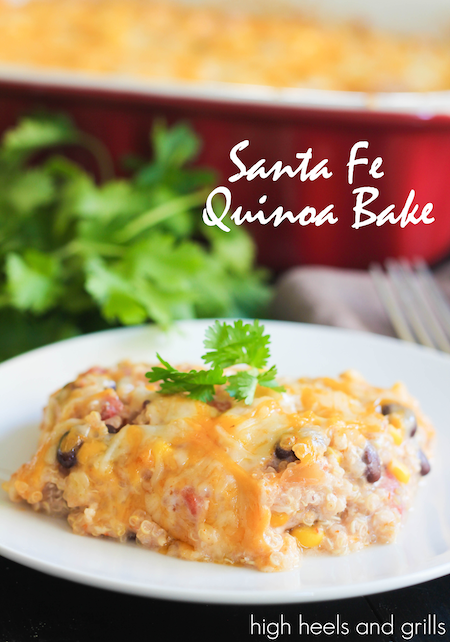 In a medium bowl, combine quinoa, corn, beans, yogurt, tomatoes, salsa, and 1 cup cheese and stir well. Spread into a greased 9×13 inch pan and top with the remaining cheese. Let bake, uncovered, for 22-25 minutes or until completely heated through. Enjoy. Conveniently, quinoa tends to be healthier than other alternatives (bacon, rice, bacon, pasta, other meats, and bacon). Which is good because we’ve made this recipe three times in the last three weeks and I’ve actually lost weight. No joke. It’s easy to serve up after freezing too! Enjoy. I’ve recently jumped on the quinoa bandwagon too! It’s so good and I love that it’s a healthy alternative to pasta and rice. This recipe looks great, can’t wait to try it out! Hi! This looks awesome. Went to print the recipe though and it took me to a smoothie recipe to print instead. Looking forward to trying this! Just made this and even my two year old liked it! Yum!! Your blog is a go – to for me. Thanks!! P.S. I added a little cumin and chili powder. I have made this a couple of times and my husband and I both love it! the second time I made it I doubled the beans and the salsa and tomatoes, its very tasty!